Q. BEL has embarked on a journey of implementing pull systems of management consulting firm in the space of Theory of Constraints in supply chain, is proud to announce that their client, secondary and primary sales points. What’s the motivation? A. Our primary sales had been growing at 20% a year. Most of the growth was coming from few products. Only a few SKUs had significant penetration among a large base of retailers. We embarked on the journey of implementing TOC processes along with our consulting partners, Vector Consulting Group, to realize the full potential of all categories. Q. What were the results? A. After enabling the supply chain, we are in the process of rolling out this initiative pan-India. Currently, the initiative is in first phase of roll out in selected branches. 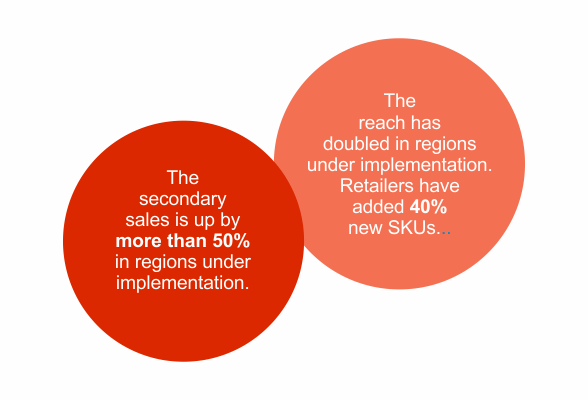 The reach in these regions has doubled, retailers added 40% new SKUs. The secondary sales have gone up by more than 50%. Q. What have been the implementation challenges? A. The implementation is a paradigm shift not only for us but also for distributors. Many age-old industry beliefs had to be challenged. For example, we had to move away from pushing for primary sales targets. At the same time, steps were taken to create price hygiene to avoid territorial conflict and to protect the interests of retailers. The distributor had to be convinced to deploy resources to improve range and reach. Many distributors ï¿½cherry-pickedï¿½ outlets based on sales volume and payment realization comfort, all other outlets were termed ï¿½bad countersï¿½. We had to break this myth of ï¿½bad counterï¿½ by ensuring retailers capital is not blocked and at the same time see that each retailer has a single source of supply. The process of supplying small lots frequently helped break the myth. We also changed our volume-based schemes. The results are exciting.